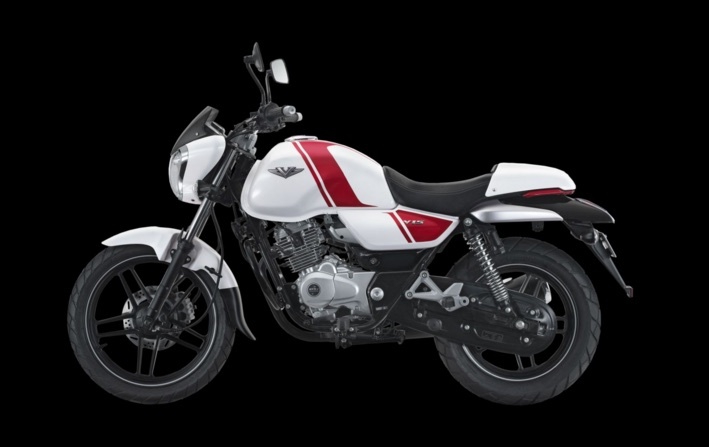 Earlier in the month of February Bajaj had announced their new V15 bike. Bajaj Auto, one of the leading 2-wheeler manufacturers in India has now officially opened sales of Bajaj V15 in India. While the ex-showroom Mumbai price of Bajaj V15 is Rs.64,943, the on-road price in Mumbai is 74,746 INR. As we know, Bajaj V15 motorcycle’s fuel tank is made of metal from INS Vikrant, the Indian Navy’s first aircraft carrier. The Bajaj V15 has got a huge demand from its customers, there is a waiting period of 90 days according to sources at the dealerships. Under the hood, the V15 is powered by a 150cc DTS-i engine which delivers a maximum torque of 13 Nm at 5500 ROM. The V15 Motorcycle delivers a peak power of 12 PS at 7500 rpm. The engine of the bike is coupled to a 5-speed manual transmission gearbox. Some of the other good features of Bajaj V15 includes a trapezoidal headlamp rated at 55/60W, 33 mm diameter front fork and rear shock absorbers – the largest in its class, a removable rear seat cowl, an instrument cluster with a dual colour LED fuel level indicator, a LED tail lamp, aluminium die-cast wheels with a double spoke design, a 240 mm front disc brake and a 120 section rear tire. The all new Bajaj V15 comes in 2 different color variants: Ebony Black and Pearl White. The bookings for Bajaj V15 has already been started since February 1st – customers have booked the bike by paying an amount of INR 1000. The all new Bajaj V15 competes with Suzuki Gixxer, Hero Extreme and Honda CB Unicorn.